The Problem still persists with 4.14. 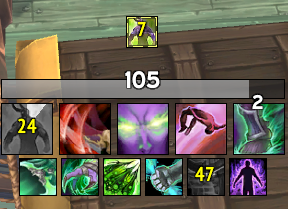 I made a Screenshot where you can see the font has the same size for every weakaura which makes the cooldownfont to small for some WA's and to big for other ones. It was much better before when the size of the font scaled to the size of the weakaura. This is because of some backend changes in ElvUI. It may stay this way. You might have to start using the WA Cooldown options. Looks like this got 'accidentally fixed' in the most recent Dev version.